Tether includes the ability to constrain the element within the viewport, it’s scroll parent, any other element on the page, or a fixed bounding box. When it exceedes those constraints it can be pinned to the edge, flip to the other side of it’s target, or hide itself. Tether optimizes it’s location placement to result in the minimum amount of ‘jankyness’ as the page is scrolled and resized. The page can maintain 60fps scrolling even with dozens or hundreds of tethers on screen. 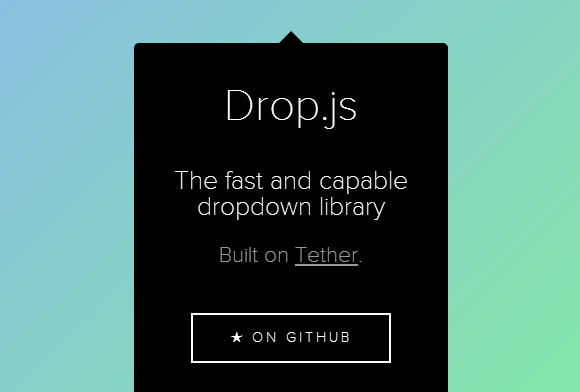 Tether is 5kb minified and gzipped, and supports IE9+, and all modern browsers. I’m one of the creators of Tether, thanks for featuring it! It’s actually MIT licensed, which, I believe, is better than not having a license at all, as it explicitly lets you do whatever you want.